Powerful Subscriber Web Pop Forms to Grow your Email List! 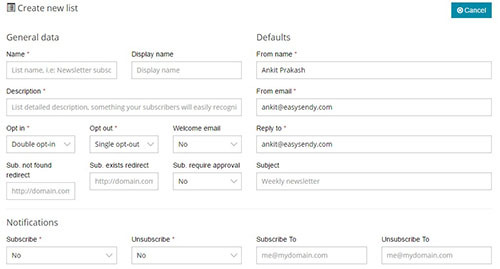 Add highly customizable EasySendy Web Popup Forms to your website and capture emails of your visitors. Automatically subscribe them to email drips and keep them engaged with high converting emails. Use EasySendy Drip powerful visual web pop editor to create your unique web pops with many layers and preview all the changes in live mode. 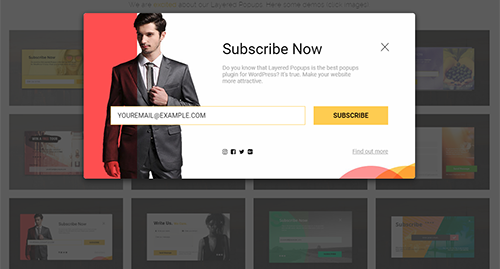 Enable your visitors to subscribe in few clicks with social subscribe button on your website pop-up forms. Add subscribe button for Facebook and Google on your Web Pop-up Forms. Trigger website popup forms based on your visitor’s webpage scroll behaviour and exit intent from the website. 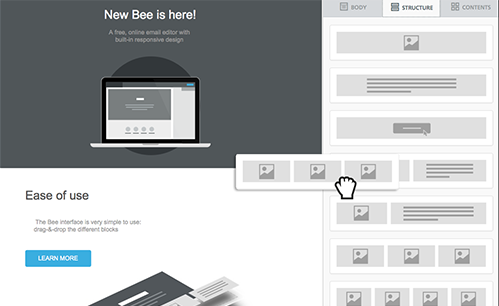 Select from a 250+ wide range of Pop up Form templates available in the template library, and add them to your website in seconds. Use motion rather than static images for your conversion. Video Pops lets you pull any video asset from YouTube to retain visitors’ attention long enough to make a brand-viewer bond. Create responsive popups using EasySendy Drip Web Pops to attract and capture visitors on the go, be it on smartphones or tablets. Add reCAPTCHA to your website popup forms and protect your email reputation from harmful bots / spam email submissions. Make your popups more user-friendly with customized signup messages and alert your visitors when they enter incorrect information. Maximize your conversion rates by creating separate messages for returning visitors and new visitors. Leverage your second chance with your returning visitors to make them stay and get converted into potential subscribers. Integrate Google Analytics or Google Tag Manager with your EasySendy Drip account in few minutes and start measuring your traffic conversions. Use Web Pop Form smart targeting features to display relevant promotions to your existing traffic and drive in more revenue with an improved sales conversion rate. Upto 25% of retargeted visitors can engage to your messages and convert into customers or subscribers. Powerful Drag and Drop Drip Email Builder to Engage Subscribers Automatically! Email Drip campaigns are the secret to achieving high email engagements, which leads to higher inbox placement. Sending timely drips to your subscribers lets you to retain and grow your customer base in lesser time. EasySendy Drip includes professional and easy to use drag and drop drip email automation flow builder. 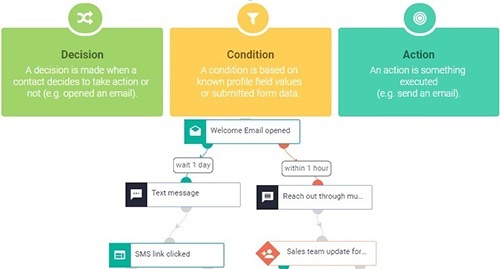 Build the automation drips based on different conditions, decisions and actions of your subscribers, increase email engagement and inbox placement rate for your email campaigns. Welcome your subscribers with a welcome email series, that are sent over a period of time. Based on your subscribers’ interaction with your email, trigger the next action accordingly. 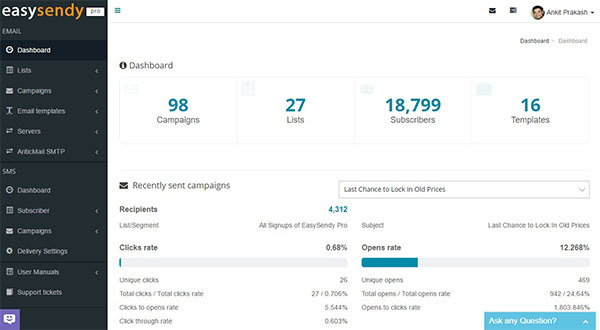 Take the next action based on email click and email open decisions of your subscribers. Automatically change their list, copy/ move them to other lists or update custom fields of your subscribers. Read replies from your mailbox and automate the next actions, like unsubscribe, blacklist, unconfirmed, delete, move, or copy email subscribers to a list. Schedule and deliver email campaigns according to your subscriber’s time zone. Trigger more engagement by sending emails exactly when your subscribers will open their inboxes. 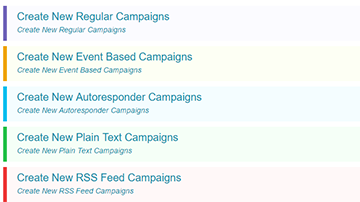 EasySendy Drip email campaign dashboard has an overall application detail, which includes email campaigns, email lists, segments and details about email templates. It also shows recent activities by the email subscribers. Image to Text Ratio is the key to email marketing success. Optimize Image to Text Ratio to approximately 40:60 & deliver emails to subscriber inbox. Use only 1 small image and 2-3 hyperlinks inside email content body, deliver email campaigns direct to inbox. Keep you email body content simple and personal to improve email open rate. Keep all of your email list fresh, updated and manage at one place! 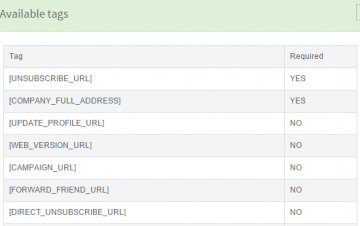 Quickly import existing emails inside email list and integrate EasySendy Drip email lists with your existing apps, automatically import leads from Facebook Lead Ads, Landing Pages, Lead Ad Forms and EasySendy Web Pop Forms. EasySendy Drip offer easy to use drag and drop email template editor to create email templates. These email templates are compatible on multiple devices and email clients. With drag and drop editor, you can create email templates with existing email template blocks without any knowledge of writing code! Inside EasySendy Drip Email Campaign builder, you can easily upload existing / pre-build email template within few clicks from .zip file. Inside EasySendy Drip Email Campaign builder, you can easily import existing / pre-build email template from .html file. EasySendy Drip had wide collection of email templates for various business. You can easily select the template, modify and send the them in email campaign. Create Plain Text Email Templates with CKEditor and format the template according to campaign requirement. Manage and schedule email campaigns according to your business requirements! Building and delivering an email campaign is the core of email marketing application. With EasySendy Drip you can create A/B split campaigns for your email. Once you have designed email campaigns, you can deliver them through one or more cloud email delivery servers. Create Event Based email campaigns and deliver email to your subscribers on their important dates like Anniversary, Birthday and so on. Plain text email campaigns have highest email delivery to inbox. Subscribers also like to engage more with plain text emails. With EasySendy Drip you can easily build Plain Text email campaigns. Add Emoji of your Choice to Email Subject Lines! 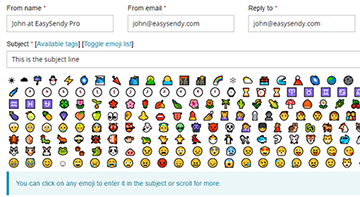 Make your email subject line attractive by adding Emoji from EasySendy Drip extensive library of Emojis. Emoji in subject line drastically improves email open rate for email campaigns. Add favorite email delivery server from your end to EasySendy Drip and deliver email campaigns as per your requirement. Optimize the delivery of emails through wide range of options. Add cloud SMTP servers from Amazon SES, Aritic Mail, Mandrill, SendGrid, MailGun. 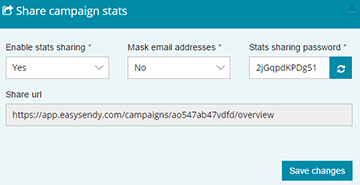 EasySendy Drip Email Campaign reports show each and every detailed interaction of email campaigns with the subscribers. You can view open, unopen, unsubscribes, bounced, clicked under email campaign activity and view email open Countries and top devices. Along with 24 hours performance graph, Top domains for all opens and clicks and activity maps. Give access to detailed email campaign reports of sent email campaigns and protect the same with a password. 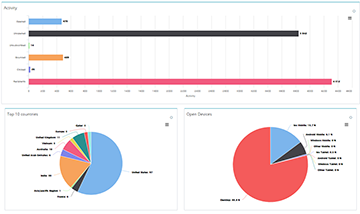 Share the given link with your client or manager who can easily view the reports in their browser. Your First 1000 Subscribers are free!